My interest in motorcycles began in 1946, when, as a teenaged Gwen Wickham, I cheered on my heroes every week at Wembley Speedway. A few years later, after my family moved from North London to Southampton, I met Jack White, a great character who taught me to ride a motorcycle, became my best friend, and eventually, in 1958, my husband, although he was 24 years my senior. 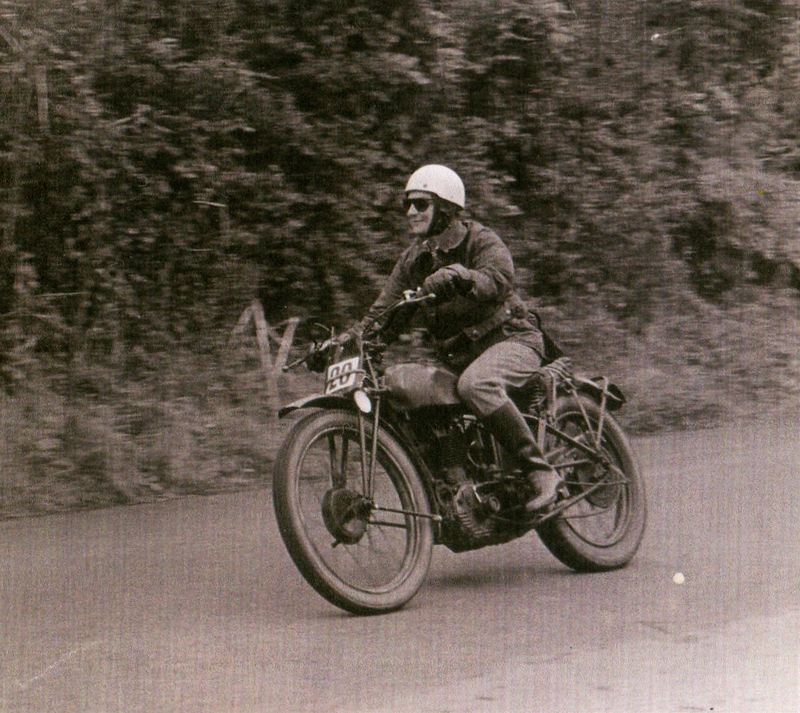 ‘Jackie’ White was a well-known member of the Ariel works trials team just before the war (he’d made 3rd Place in the 1934 Scottish Six Days trial), and he encouraged me to ride in trials with him. 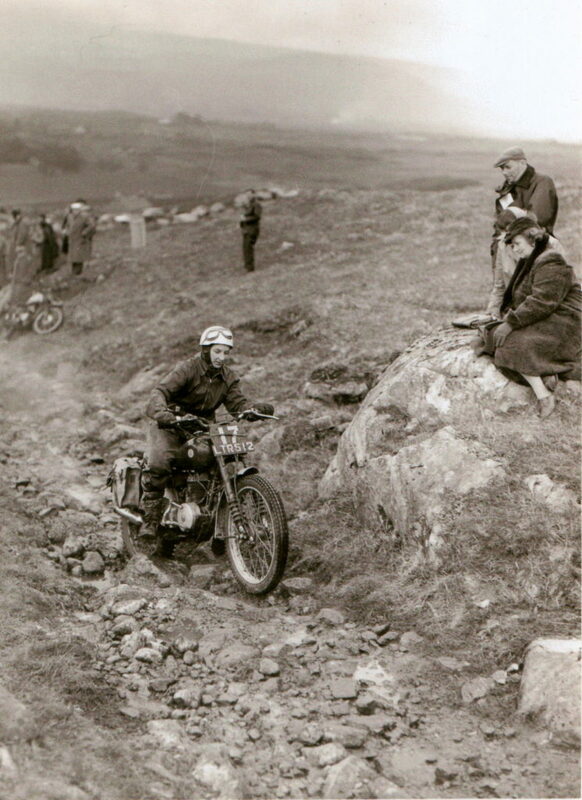 My first trial was the Sunbeam MCC’s Novice Trial in 1950 on Jack’s ‘Flying Flea’ Royal Enfield. Another competitor that day was Mike Jackson’s elder brother John, who at 17 was also competing for the first time! Jack then prepared a 125cc BSA Bantam for me, which I rode in open-to-centre trials most Sundays and a few Nationals when I could get a Saturday off from my job in a hospital. 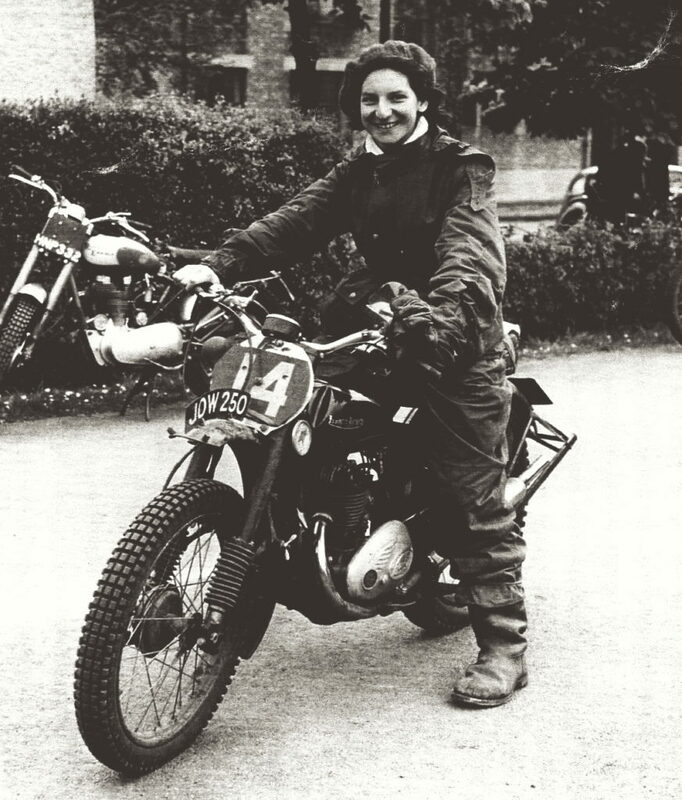 In 1952 I was 21 years old, and progressed to a 197cc Francis Barnett, and rode it in that year’s Scottish Six Days Trial. 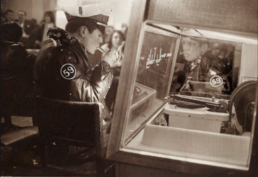 In those days we started from Edinburgh and I remember lying awake in the George Hotel listening to a nearby clock chiming every hour throughout the night – I was too excited and apprehensive to sleep. One of the biggest adventures of my life was about to begin. On a damp, grey morning the Provost of Edinburgh was the starter for our long journey to Fort William. The scenery was breathtaking, with the morning sun turning the snow on the mountain tops a delicate pink. It reminded me of the time I had struggled up Kinlochourn, to arrive at a mirror image of the sunlit mountains and pine trees of Glenelg reflected in the still water between us. I was glad that I was not a leader in the trial, and could afford to squander a little time to drink in the beauty of the scene. 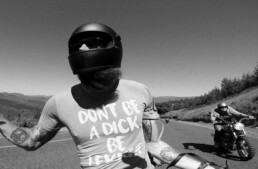 Such was the comraderie amongst the riders that almost everyone who passed me asked if I was OK. 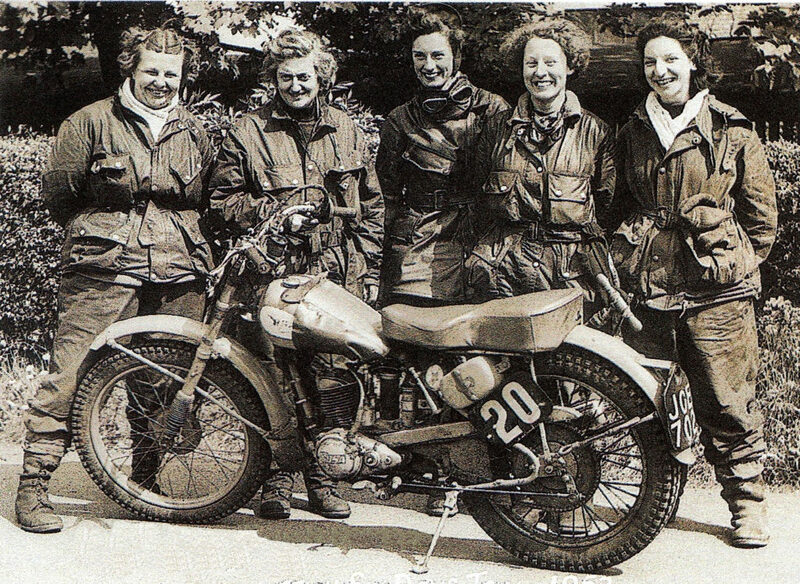 In 1952, the generosity with which we girls were treated by the other riders was heartwarming. There were 5 of us; Mollie Briggs, Barbara Briggs (no relation), Joan Slack, Leslie Blackburn and me. Needless to say, a fellowship developed between us. Jack had a similar bike in 1952, and had modified both of them by fitting friction dampers to the forks, and had altered the steering head angle, which made them handle well. Unfortunately, Jack’s bike developed ignition trouble and he had to retire on the Wednesday, but mine carried me to the finish ‘without missing a beat’. The Scottish was an adventure and experience that I shall never forget; the combination of Highland scenery, motorcycles, and old friends is irresistible. I was lucky enough to ride in it again in 1957, this time on a 197cc James Commando (incidentally, the previous owner was John Jackson – he and Mike were fellow Southampton Club members and were by then very successful trial and moto cross riders). I was privileged to meet people whom I have since realised were legends, including Alan Jeffries, a cheerful, kindly character, who offered to replace the frame of my James if it could not be repaired. It had twisted during a fall on the Wednesday and the chain had run off the sprocket at the slightest provocation for the rest of the trial. The experience of riding a motorcycle in this state over the forbidding Rannoch Moor, which seemed endless, certainly plays its part in preparing me for traveling anywhere on a tarmac road. I managed to finish the Trial, but with a large loss of marks! I rode Francis Barnett until 1955, and then the James, in some of the other Nationals including the West of England, The Welsh Two Days, Beggars Roost, Cotswold Cups Trial, the Hoad Trial, and the Perce Simon Trial, the latter being close to home for me and in those days, run on the New Forest. 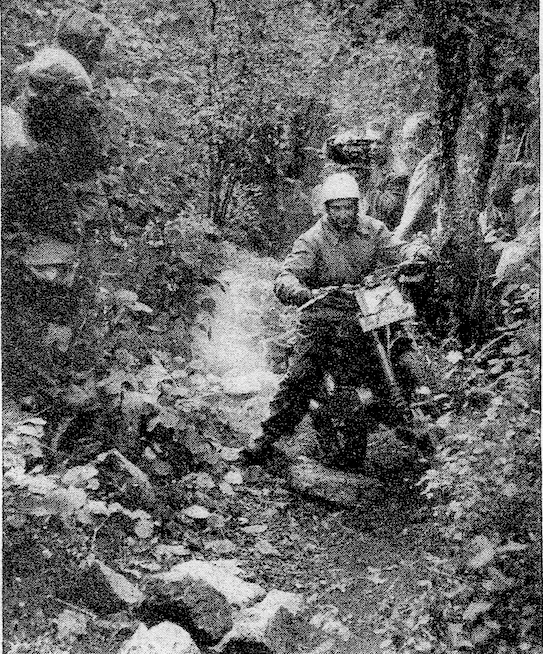 What I loved most about trials was the fun, comraderie, and challenge, all in beautiful surroundings to which one would never normally have access on a standard road vehicle, although most of us in those days rode the same bike to work each day! 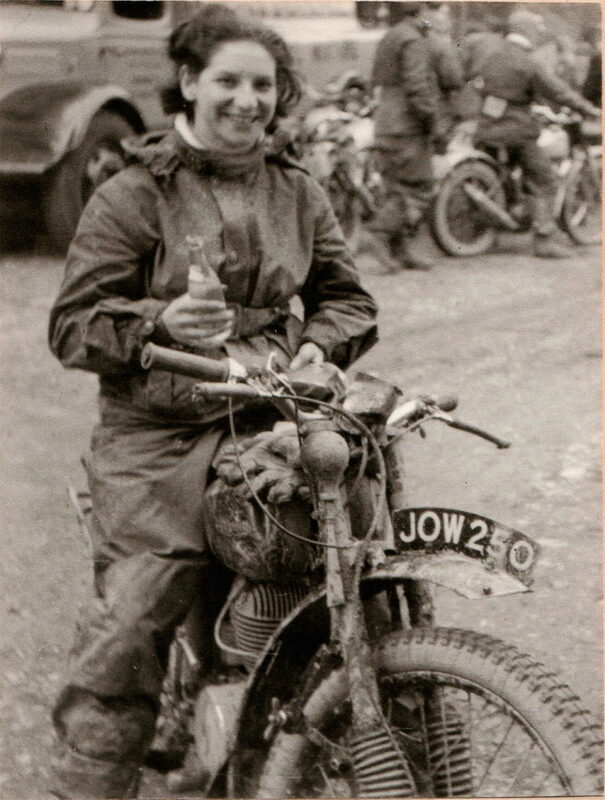 Gwen at rest during the West of England Trial in Devon, 1952. Photo and lemonade courtesy Mr. Huntley, the Francis Barnett rep.
Jack and I were married in 1958 and we set up home together. When our two daughters came along I gave up competition riding, but still rode a bike on the road. I also rode the odd vintage bike, including Jack’s 1930 Ariel 250cc Colt in a few club runs. 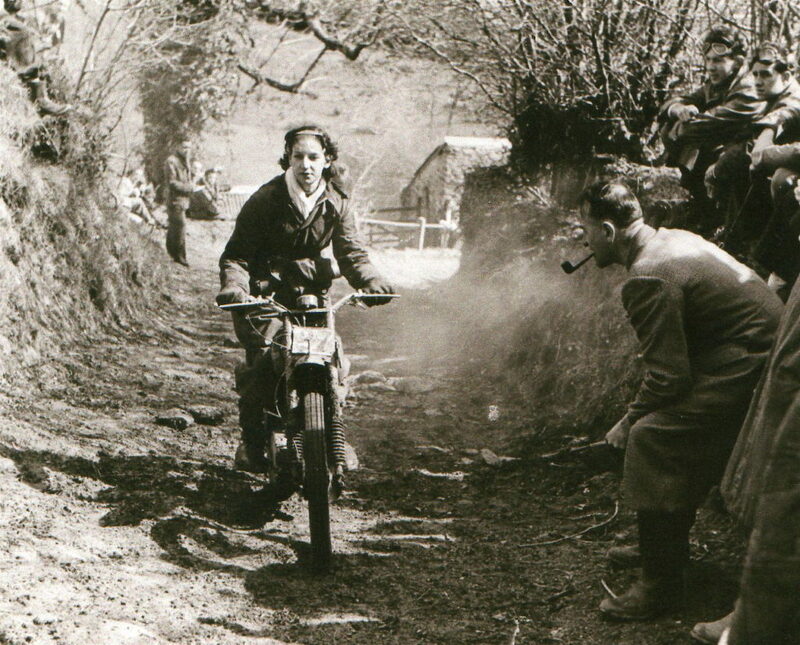 Sadly, Jack died in 1977, but I still have that battered up old Ariel on which he won so much, including third place in the 1934 Scottish Six Days [the photo below shows Gwen riding the Ariel at a Vintage club run in 1995 – Ed.]. Despite advice to the contrary, I refuse to have it restored. To remove all its battle scars and Jack’s modifications would rob it of its considerable character! 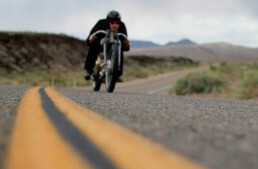 I have never lost my love of motorcycling which, these days, I enjoy as a spectator, along with the great friendships which have survived the years. 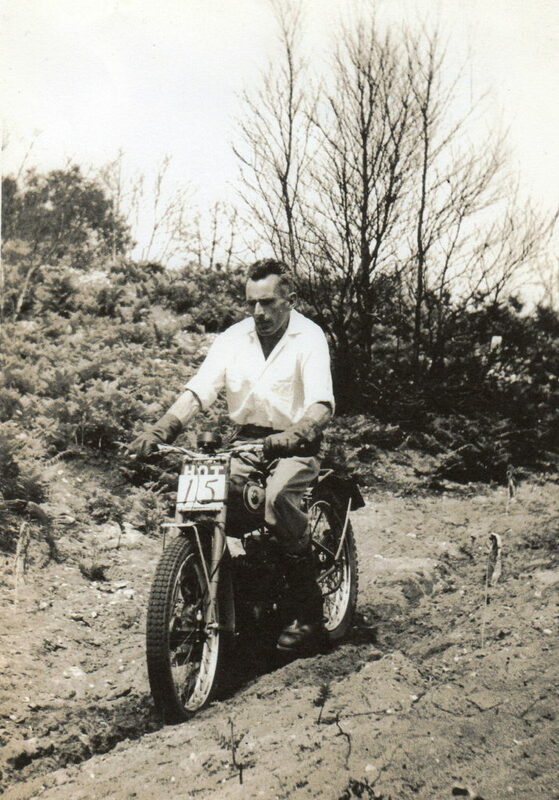 ‘Jackie’ White on his 125cc Royal Enfield, ca 1951 – note white shirt, clean so far, and the deep soil track. It must have been a warm day – no mud, no jumper or jacket. Thank you Gwen White for letting us in on a little bit about your life and trials riding. This was great to read especially as my great aunt Molly Briggs is mentioned and photographed with Gwen and the other talented racing women. Gwen just died this year – I only heard recently. She was a lovely woman and I was lucky to know her!